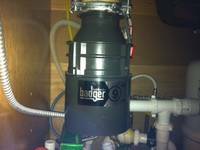 Posted on Fri, Dec 30, 2011 : 11 a.m.
Hi Keith, My garbage disposal has a horrific smell that will not go away. Got any ideas to get rid of it? During the holidays we tend to give our appliances a healthy workout. All of our holiday meals flowing through the disposal can accumulate in and around the disposal causing a nasty smell. First, clean the rubber cover by washing it in the dishwasher, then clean under the flaps with a brush and soapy water. If that doesn't help, then chances are the debris has accumulated inside the unit. No worries, as this also relatively easy to clean. Freeze vinegar in ice cube trays and slide them inside the garbage disposal. Allow the pieces to sit for approx 10-15 minutes, which will help solidify any debris within the unit. After that time frame, turn the unit on. Allow the vinegar ice cubes to pulverize and clean the inside of the unit simultaneously. Rinse thoroughly with cold water. That should clear it out and leave your garbage disposal with a nicer smell. Another suggestion from my good friend Joe Gagnon, the Appliance Doctor, is to cut a lemon in half, microwave from 30 seconds to 1 minute, then cut into smaller pieces and flush through the disposal with plenty of water. Make sure to keep grease out of your disposal. This is not only a possible cause of your odor but can cause pipes to clog and back up. A garbage disposal is designed to be low maintenance and self cleaning. But a little refreshing once in a while should keep your kitchen smelling the way it should.